2019 ICC Cricket World Cup: It would come as a grievousness for Indian fans who are energetic about the honorable men's amusement. In an official survey begun by world cricket body – International Cricket Council (ICC), it appears has England will have an additional edge even before the beginning of the pined for competition and top picks to lift the trophy. Mind you, England have never won the show-stopper occasion ever of game and one year from now's container will allow them to win it before their home fans. 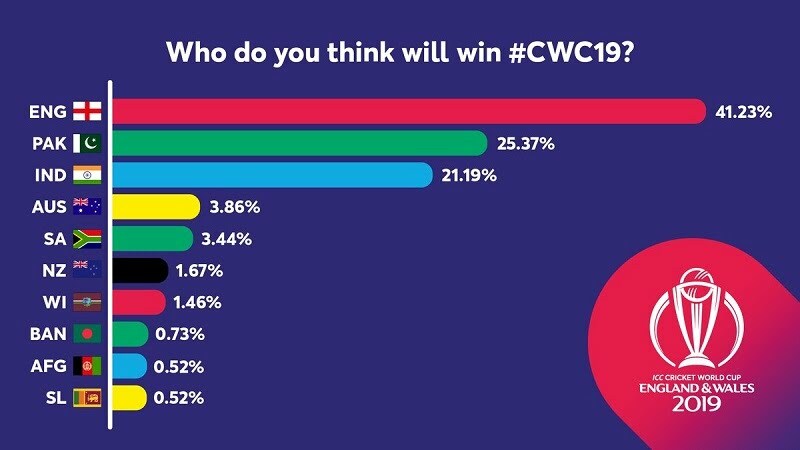 As per the survey, England earned 41.23 percent of the votes, which makes them overpowering top choices.Today Cricket Match CWC Prediction India's most despised adversaries Pakistan (25.37 percent), who have been in flawless in the shorter configuration of the diversion (ODI) are at the second top choices to win the world title. While, a lot shockingly the men in blue will complete third according to the fan survey, they get just 21.19 votes. How come Pakistan is at no. 2? doesn't make any sense considering our recent performance. Although there are some one day matches coming up before WC in which we can improve, perform and get ready but still!!! Our batting is inconsistent, our bowling is inconsistent, our field is inconsistent.....no chance!